The Nice Lawn Tennis Club is one of the prestigious and oldest Tennis Clubs in France and the oldest tennis club in Nice. Founded in 1890 at the Parc-imperial, the Nice Lawn Tennis Club (NLTC) has a rich history. Before becoming a tennis powerhouse, the NLTC was known for being the European aristocracy’s prefered holiday destination. Now, the Nice Lawn Tennis Club is known for having world-class players, like Suzanne Lenglen and Max Decugis, in their ranks. The Club started establishing itself as one of the best training destinations in Europe back in the 1970s. It even hosted the European Men’s Team Championship in the 1980s and the 1997 Fed Cup semifinals, featuring players like French Open Winner Yannick Noah. The club hosts the 250 Nice Cote D'Azur Open each year. 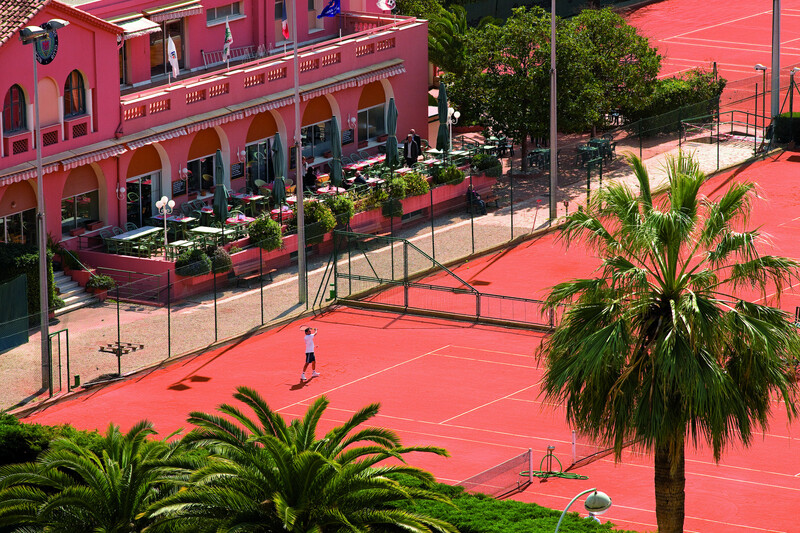 Nice Lawn Tennis Club is ideally located, only a few minutes’ walk to Nice Old Town and The Famous Avenue des Anglais. 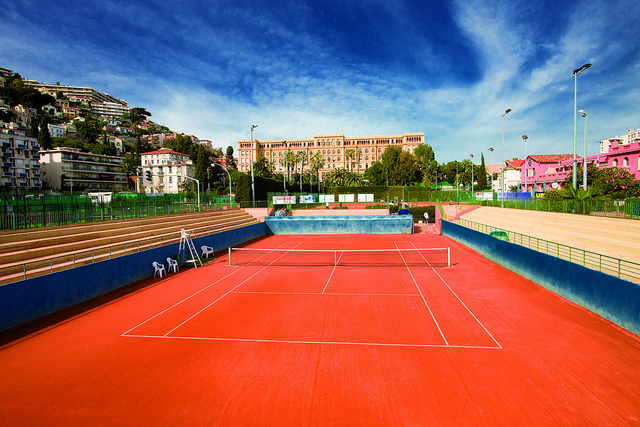 The club features 18 clay courts, including a center court stadium, as well as fitness rooms, yoga studios and saunas. The Club also offers performance training, tennis study, a junior club and individual tennis lessons. World Tennis Travel has negotiated directly with the Nice Lawn Tennis Club, and we offer exclusive packages available only to our members. The Promenade des Anglais is one of the world's most famous beach avenues. World-class hotels and groovy beach clubs adorn its crescent-shaped shoreline. The Promenade des Anglais offers a great chance to take long walks and enjoy the Mediterranean coast. You can stop at one of the local-owned classic French cafes to enjoy an espresso and learn about the area’s rich folk history. Nice Old Town (called "Vieux Nice" in French) is a must-visit if you travel to Nice. Old Town is usually busy with everyday hustle and bustle, but it offers a glimpse into the soul of Nice. This gorgeous Old-Styled French setting is one of Nice’s major attractions because it offers local food, drinks and products. Nice is also home to Cours Saleya, located in Marche Aux Fleurs (Flower Market), a mecca for food lovers. The combination of colors, smells, tastes and sounds creates a true, exotic holiday feeling. The fresh local products and handmade souvenirs make it the perfect place to pick up a gift for your friends and family back home. Monaco is one of the French Riviera's most appealing cities. Boasting of 4 kilometers of beautiful Mediterranean beaches, Monaco is just a short drive away from nice. Although it’s small in size, Monaco is a well-known, traditional French city. It’s one of France’s economic and tourist engines, and is host to professional football and rugby clubs. Not to mention its biggest sports attraction: the Monaco Grand Prix. From Monaco (or Nice itself) you can hire a car and drive to Eze village, which is a famous medieval village nestled on the top of the cliff overlooking the Mediterranean sea. Alternatively, you can decide to take the train from Nice to Monaco that follow the coastline, and stop in one of the gorgeous coastal villages between the two popular cities. Eze Village is a peaceful, quiet town located between Monaco and Nice. The old town is perched atop the French Riviera, overlooking the Mediterranean Sea from the top of a 420 meter cliff. It’s now one of the French Riviera’s most visited locations. The ancient village sits aloft the ruins of the 12th century medieval castle. The Jardin Exotic or Jardin Botanique d’Eze is home to a huge collection of succulents and cacti,, one of the many fun activities Eze has to offer. Not to mention the panoramic view of the Mediterranean. The St Nicholas Russian Orthodox Cathedral is located right next to the Nice Lawn Tennis Club, and it’s the most visited historic building in Nice. Tsar Nicholas II, the head of the tragic Romanov family, commissioned the building of the Cathedrale Orthodoxe Russe St-Nicolas à Nice in the early 20th century. The St. Nicholas Orthodox Cathedral is the biggest Russian orthodox cathedral in Western Europe, and it was inaugurated in 1912. The Cathedral is legally owned by the Russian Federation, and is also one of France’s national monuments, giving it a unique status among traditional landmarks. Nice is renowned to be a major cultural city and is home of many prestigious museums. The cultural attractions includes the Musée d'Art Moderne et d'Art Contemporain (or the Museum of Modern & Contemporary Art), one of Europe’s most renowned art museums. A great day trip idea regardless of the time of the year. Open Tuesday through Sunday (closed Monday), this museum is also free though you'll have to pay a small fee for a guided tour. Keep in mind that recent travelers rave more about the building's architecture and panoramic views than the art, and they especially recommend a visit to the rooftop for a sweeping vista of the city. Other local attractions also include the Chagall Museum, always a part of traveler itineraries. Come prepared and bringing your passport (or driver's license if you're a French citizen) for admittance. 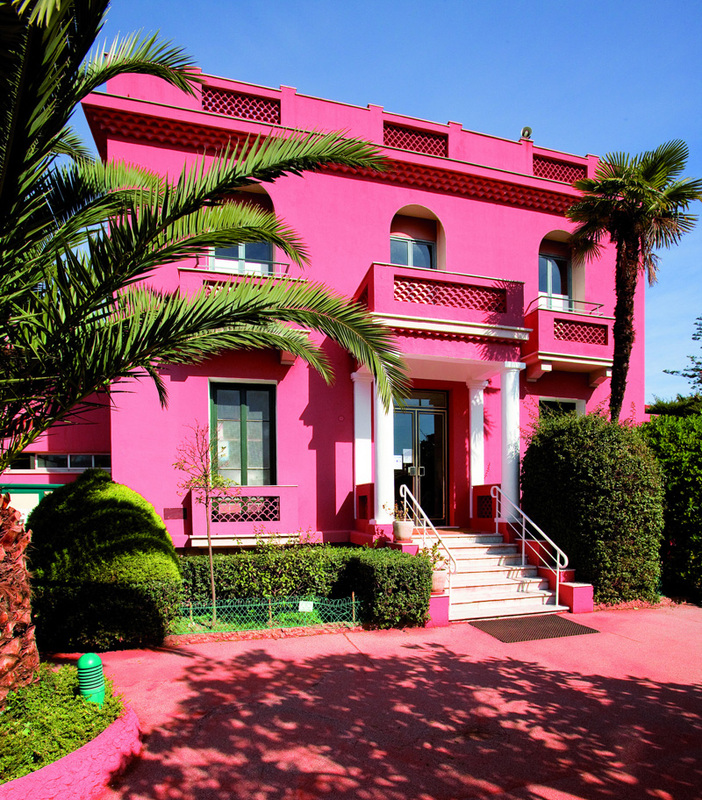 Also note you can visit the Musée Matisse a surreal art-house dedicated to Henri Matisse’s work. Visitors appreciate the Matisse Museum for the aesthetics of the museum, the airy 17th century villa - as well as the works it houses. The combination of a family-friendly atmosphere and a fierce tennis program make it one of the top tennis holiday destinations in France. The NLTC is well-equipped for sports and leisure activities while boasting of luxurious facilities that cater to all age groups.